This little devil with a devilish grin is only about two and a half inches tall. He’s made of a composition material in a hollow mold. 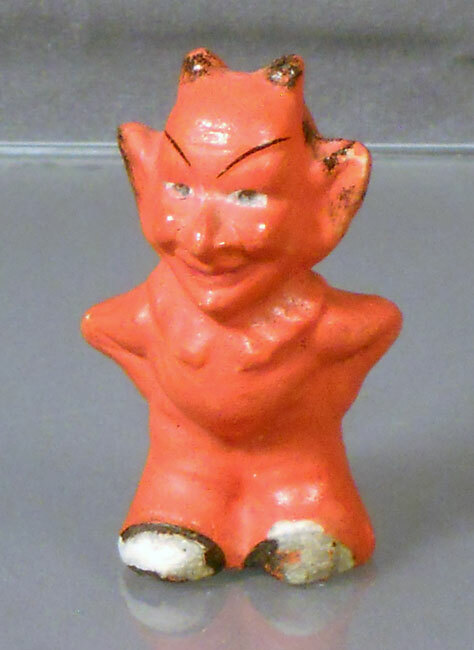 Obviously, his feet need a little restoration, but devil figures, especially cute ones like this, aren’t easy to come by. He was probably made in Japan in the 1920’s or 30’s and may have been glued to a little box that held candy. He’s been part of our Halloween collection for many years now, and he always puts a smile on our face. Hopefully, he does the same for you. This entry was posted in 1920's, 1930's, Carol, Halloween, Holiday, Monsters, Weird. Bookmark the permalink.